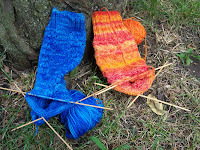 Way back in July, I started two pairs of socks. The swimming pool socks and the Blazing Sky Hiking Socks. Since then, I have not really provided much of an update. So what has happened to these projects? Both have, for different reasons, been sent to the frog pond. I was not happy with the combination of pattern and yarn. I think the yarn (handspun by me) needs a simpler pattern and the pattern needs a solid color yarn. I have some new ideas, and I may cast on later today. Now for Swimming Pool - I finished the first sock. I am very happy with the results. I did not cast on right away for the second sock. Actually, it was a couple of months before I started the second sock. I made great progress on the second sock. I finished it on Friday night. I put the two socks side by side and . . . the second sock was HUGE. I was wondering why I ran out of yarn before finishing the second sock, but not the first. Then I realized, I must have grabbed the wrong sized needles when I started the second sock. I checked the pattern - it calls for size 1 needles. I was using size 2. ARGGGHHHHH. I had even sewn in all the ends. You think I might have noticed the difference a few weeks ago when I took this picture - but no. So I have restarted the second swimming pool sock, on the correct sized needles. I am so sick of knitting this pattern. It's for a Christmas gift though, so I must carry on.